June is audio book month, which is a good idea since so many people are traveling. Today's featured review is an audio book that would be perfect for a road trip. It is entertaining and engaging without being a huge distraction. Also, the subject matter and time period (late 1950s to 1960s) would make for great discussion when you stopped for meals. 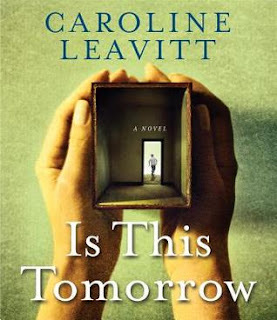 Is This Tomorrow by Caroline Leavitt is a coming of age story, but not for one character, but for an entire neighborhood in Waltham, Massachusetts. It was a time of transition for nation. Fears were rising do to the threat of communism and the changes in societal rules. The issues of communism paranoia, civil rights, and the breakdown of the family unit - divorce - are brought into focus in the suburban neighborhood. It's 1956, and working-mother Ava Lark and her son, Lewis, have rented a house in a less-than-welcoming Boston suburb. There, Lewis finds he is only able to befriend the other fatherless kids on the block, Jimmy and Rose. But when Jimmy goes missing, neighborhood paranoia ramps to new heights, further ostracizing Ava and Lewis. While there are misgivings and suspicion of Ava, "ostracizing" is a bit strong. Even today if a child went missing we would question and scrutinize more closely those people who regularly brought strangers into the neighborhood. In the 1950s when divorce was a rare occurrence, of course they are going to be suspicious. Yet, there are mentions of neighbors helping her out. The coming of age story comes from how each person deals with the disappearance of young boy. In real life we often do not see the years that follow as a community heals. While it seemed that most had moved on in the ten years that passes between Jimmy's disappearance and the discovery of his body, it was just a scab that had built up. The narrator Xe Sands was a perfect choice. She delivers the story in just the right voice. One could almost forget it was recording and not the characters themselves. It can be said that Is This Tomorrow is greater than the sum of its parts. There is not one thing I can point to and say "that's what made it great". It when you see the whole picture that you realize what a wonderful work of fiction it is. Girl Who Reads is an Amazon advertising affiliate; a small fee is earned when purchases are made at Amazon through the link above. A free audio book was provided by the source in exchange for an honest review. Thrilled that you enjoyed both the book and the narration! This is one of my favorite projects to have worked on, so it's doubly gratifying to know it was enjoyed. Thanks for the comment. It was really a brilliant work. So thrilled you enjoyed the novel and Xe's fabulous work. I'm so, so happy.